Pancakes are breakfast royalty. Soft, fluffy, coated in syrup, fruit, powdered sugar, chocolate chips (whatever you like! ), Nebraska is serving up some seriously mouthwatering options. From cinnamon roll pancakes at Omaha eateries to fruit-topped options in Grand Island, here are the best places for pancakes in the state. Jimmy’s is the place where customers are greeted with a smile, hot, fresh food and where the pace is fast but the atmosphere is relaxed. It’s also where everybody knows your name! And though Jimmy’s might be mainly known for their fantastic eggs, they are also well known for their pancakes. Enjoy a mini stack of buttermilk or whole wheat pancakes, or go premium with double blueberry, cinnamon roll, reese’s, sweet potato or chocolate chip pancakes! You’ll be smiling ‘til dinner! The Engine House Café has a bit of history behind it. It was the original Engine House #4 fire station, built in the 1900s. The original wood ceilings throughout give the building character, and all around are various memorabilia of past and current firemen, their families and friends. In addition to all that history, it’s the pancakes that make this place even more memorable. These pancakes are as big as your head! Round, fluffy and gigantic, just the way a pancake should be! Choose from flavors such as apple cinnamon, banana-nut, blueberry, butterscotch, chocolate chip, cranberry nut or oatmeal cinnamon raisin! Greenfield’s Pancake House and Restaurant is where residents of Lincoln brunch, all day, every day. And why wouldn’t they want to keep coming back? Their pancakes are incredible! Choose the “All You Can Eat Pancakes,” buttermilk or multigrain, the signature buttermilk or multigrain pancakes and add blueberries or chocolate chips. Another interesting favorite that customers can’t stop raving about are the cinnamon roll pancakes! Three house buttermilk pancakes with cinnamon swirls topped with icing and whipped cream! What’s not to love about Vidlak’s Brookside Café? They’ve been serving scrumptious, home-cooked dishes at affordable prices since the mid 1990s. The pancakes are hot and hearty, made from scratch, and are served with butter and smooth, warm maple syrup. And there are a variety to choose from! Enjoy traditional buttermilk cakes, blueberry pancakes, German potato pancakes, bacon stuffed cakes, and silver dollar pancakes! When you eat Vidlak’s, you may enter as a customer, but you’ll leave as a member of the family. Kirk’s has some of the best pancakes in the Lexington area. Locally owned and operated for over 30 years, Kirk’s menu is all about comfort food. Enjoy three homemade pancakes, served with your choice of bacon, sausage or ham with butter and syrup on the side. In addition to featuring some of the best pancakes, they also have a sports bar and grill on site as well for those who want to enjoy a Sunday night game. The Mixing Bowl is about bringing great friends, great family and great foods together, and was created to fulfilled a desire to provide the Gering Valley area with home cooked food. Chef Jamie’s menu consist of delightful, tasty home cooked dishes just like Gran used to make, as well as other appealing, contemporary dishes. Enjoy the unique yet charming Swedish pancakes, featuring three crepe style pancakes served with Lingonberry sauce, or the all-you-can-eat pancakes (yes, really!). Your day is not complete until you’ve had breakfast at Le Peep! When one eats at Le Peep, they don’t just eat. They have an experience. A truly one of a kind experience with the most delectable delights one can imagine. That includes the pancakes. Try one of their “Pancakes of the Month” selections, or one of their Griddle Goods. Made with Le Peep’s homemade batter, you cannot go wrong! Enjoy the plain cakes and add granola, chocolate chips, nuts or fruit, or you can enjoy the blueberry granola or banana walnut cakes! Named “Restaurateur of the Year” in 2017 by the Nebraska Restaurant Association, the Eatery has been a local favorite for quite some time. They serve breakfast all day, every day and have the most amazing, mouthwatering pancakes one has ever tested. 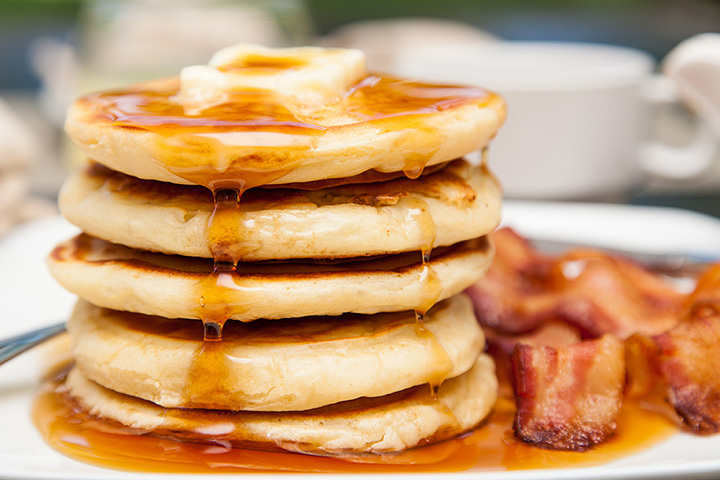 Enjoy a tall stack of five or a short stack of three buttery, yummy pancakes with real maple syrup. It’s also okay to ask for blueberry or chocolate chip pancakes as well! What this restaurant unique compared to others is they support their community by donating goods to help create meals for families in need, providing donations, and recycling! Tommy’s Family Restaurant has been family owned and operated for over 25 years and is another dining favorite in Grand Island. It’s the friendly customer service-oriented staff that keeps customers coming back, as well as the made from scratch, homemade food, but it’s also something else: the pancakes. Served with REAL butter and flavored syrup, these pancakes are just like Grandma used to make. Warm, light and utterly scrumptious, your taste buds will thank you. Customers also have the option to add toppings, including bananas, strawberries, peaches and whipped cream. You can also ask for chocolate chips! Featuring breakfast all day, every day, Perkins is the leading family dining restaurant with over 33 locations. They offer everything from omelets to chicken pot pie, burgers, a bakery filled with delicious baked goodies, and of course, pancakes. The buttermilk pancakes are warm and fluffy and so soft they melt in your mouth. No butter needed. Just pass the syrup please!